Sefton Council and Pleasureland owner, Norman Wallis, are delighted to announce today their agreement to work in partnership on the transformation of the site in the popular resort. I have mixed feelings about this. It's great news for the town, but it smacks of hypocrisy when you think of Sefton's treatment of the Botanic Gardens. At least they have enlisted a proper businessman, unlike some of their other projects. Anyway, Damien Moore will be along soon to claim credit for this. About time they backed him. Good luck Norman. Good luck to him but couldn't he find someone other than Sefton Council. 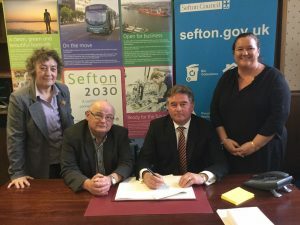 Get Sefton to give Norman a 99 year lease. His family here that long anyway, give or take a few years. How’s he supposed to get investors with a short lease. There are plenty investors world wide who would jump in with the Wallace’s if they had a long lease. Norman wants to build a hotel increase the footprint of Southports main/ only attraction worth advertising.” Which costs money”. Who else is is going to take it over. We could end up like Morcambe & Rhyl with no fair.. Unless you take a trek to Blackpool on a sunny day Which is to far and to expensive Southport is the answer. Full of eatery’s for all tastes and ages.Promot are town. I still think we should bring motor racing back to Southport beach it was what we were famous for years ago. The beach is doing nothing?? ?only my and everyone I speak to opinion. Do councillors read local forums or just take photo opportunity’s to put on them? We could end up like Morcambe & Rhyl with no fair..
How on earth do you come to that conclusion in response to the article? We almost ended up with no fair, the Council teamed up with the Thompsons, the owners of Blackpool Fair who promptly closed it down flogged half the rides to Margate and demolished the Historic Big Dipper even though it had listed status. The sun is forecast for next week. Go down the fair. Norman has got the place rocking. I hope it works out well for you which in turn works out for Southport. It was run by the Silcock Family, Thompsons invested nothing, they took it over to close it down.